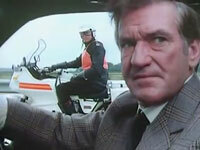 Rod Taylor plays Paul Duveen, driver of a fast, fancy car whose luck goes sour after he picks up an impish hitch-hiker, Michael Fish, played by Irish actor Cyril Cusack. "The Hitch-Hiker" is one of the 25 Roald Dahl stories adapted for "Tales of the Unexpected." For the first two seasons, each episode was introduced by Dahl himself. The series was an instant hit, with more than half of the British TV audience tuning in to the first program. The series-- filmed by Anglia Television, a regional production company in England -- was sold to more than 70 other countries. The shows were a mixture of suspense, horror and black comedy. The latter was abundant in Rod's episode. The hitch-hiker has supernatural pick-pocketing skills, and he bedevils driver Duveen into one bit of trouble after another. "The Hitch-Hiker" reunites Rod and Cyril Cusack after they appeared together in "Cry of the Innocent." "I loved every clever marvelous sneaky thing he did when we are acting together. I just watched him and laughed. We're like two very good boxers."